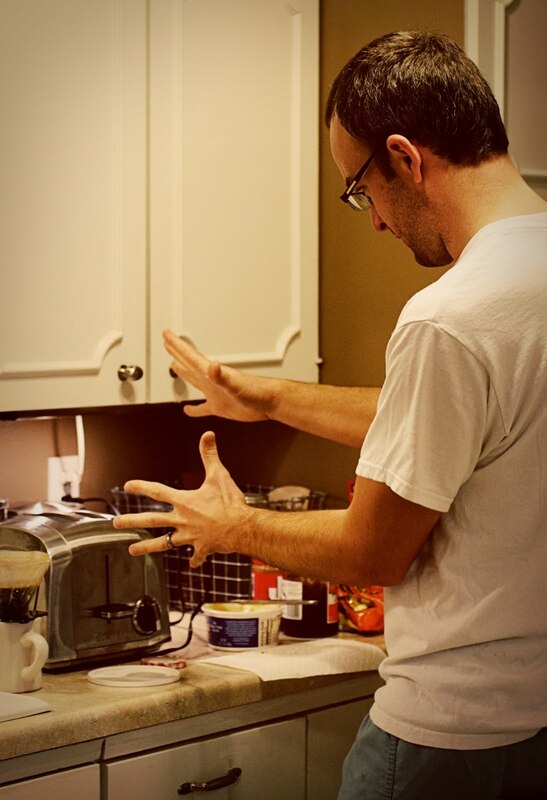 Today's Letters: Dear Darth Loerke, last weekend I caught you trying to use the Force on our toaster. Reason #986 why I love Thee. Dear Funk Off!, we know you're in the business of keeping things fresh, not funky, however, the homemade vegan truffles you sent us were d-to-the-licious. Thanks for being our California Valentine. Dear Margin, I need more of you in my life. That's all. Dear Husband, last night you made homemade cookies for the understaffed nurse practitioners at the hospital. Your heart to celebrate others challenges me! Smooth or crunchy peanut butter? Casa de Loerke is divided on this one. PS, In the past 48 hours we've raised just over $450 for our race! We still have lots of miles that need to be sponsored so head on over to our donation page and help us bring this baby home! I'm no peanut butter at all. Yuck! :(. Chris tried to use the force to get his socks into the linen basket after I told him they were stink. Funnily enough it didn't work and he had to use mere mortal power by getting up and walking from the bed to the basket lol. We are a divided house too. I'll eat smooth (but I'm not a fan) and Chris says it's got to be crunchy. I think I sponsored Mile 255 because it was 3 quarters of the way and someone had already taken the last and first mile lol. Haha! I walk in on my boyfriend using the Force all. the. time. Makes my day. I like natural. Peanuts and salt. After that, crunchy or smooth is just a bonus. You can put it on just about anything and it still tastes great. But I'm in Spain this year. And they don't believe in peanut butter. And that makes me very sad. I can handle both types of PB, but I usually buy smooth PB, and my heart goes pitter pat for Peter Pan Whipped PB! I've recently joined Camp Crunchy (it makes those peanut butter blossom cookies PHENOMENAL, try it!). Also this: "Dear Husband, last night you made homemade cookies for the understaffed nurse practitioners at the hospital. Your heart to celebrate others challenges me!" is beautiful from all angles. Smooth. When I was kid, my grandma only bought crunchy and I hated eating it when I was at her house. We are a house divided as well. I like creamy and the hubs likes crunchy. We always keep both on hand. Smooth. And. Creamy. Loving your kindness for the NPs! whoever does the shopping gets to pick. that's why i fight for the grocery list...cruchy all.the.way. dear valentines...we will forever send you love in the mail...thats how we roll. i like smooth, husby likes crunchy. but he defers to the smooth for me because he loves me and knows that the space taken up by two different jars of pb in the pantry would make me twitch. :0) and in return i buy him crunchy occasionally. ha! Smooth or Crunchy? Depends on the mood really. On PB & Js - definitely crunchy! really into the trader joe's crunchy valencia peanut butter with roasted flaxseed- double crunchy! Hubby doesn't eat it, so I get to choose! house divided...me = creamy and smooth. the husband = super, duper crunchy! although, if he runs out of his, he'll take some spoonfuls out of my jar!